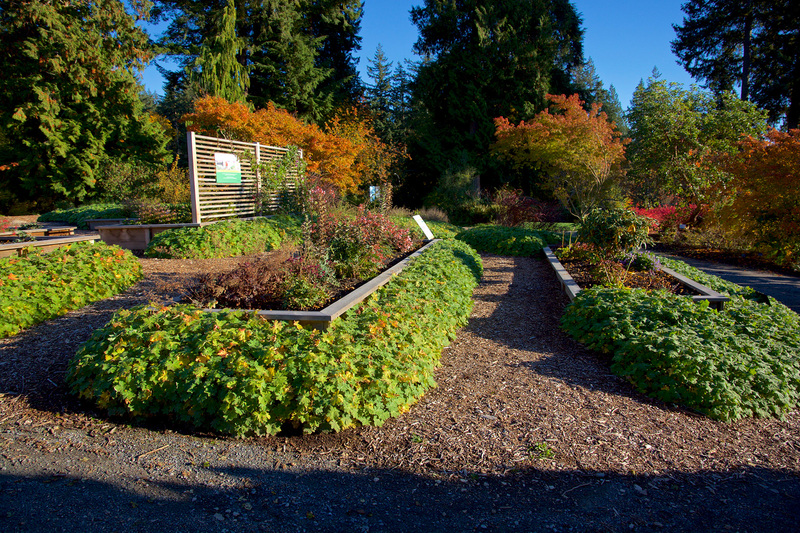 This is a late autumn photograph of some of the demonstration beds in UBC Botanical Garden developed in partnership with Metro Vancouver’s Grow Green program. Like many others in my generation living in urban environments, the idea of building a garden can be overwhelming. Grow Green is a regional resource for those in Vancouver and the surrounding area that introduces people to gardening. Programs like Grow Green can benefit communities by addressing the lack of knowledge, time, or resources that can prevent people from growing their own garden. This resource is administered by regional service provider Metro Vancouver. UBC Botanical Garden is a contributor in helping develop the program (particularly with respect to plant suggestions), providing & maintaining these demonstration beds, and otherwise promoting the resource. Grow Green offers extensive and diverse guides to help plan a garden based on plant preferences, garden type, gardening area, and gardening purpose. All of the suggested plants (see the Pick-A-Plant section) are regionally non-invasive. In addition to information accompanying each of these suggested plants, the program offers templates for garden designs and plans (included among these are lawn alternatives). This allows new gardeners to have easy recipes to build successful combinations of plants with professionally-chosen colour palettes and plant textures. For more experienced gardeners, these templates give a starting point to be built from and added to. In addition to helping people become successful gardeners, the creation of sustainable gardening spaces like those suggested by Grow Green can increase wildlife habitat in urban environments, greatly benefiting local species (especially pollinators!). If you don’t have a similar program to Grow Green in your region or city, perhaps forward the site to your regional or city planners as a starting point for discussion on how to develop something similar for your community! I’ll add to what Dominic wrote above that the construction of the demonstration beds and the plantings were done as a learning exercise by last year’s Horticulture Training Program students. Curious what is the function of the plants growing at the base of the raised beds? Looks like hardy geranium, perhaps to shade bed/soil from the heat of summer sun? Mostly as filler, I think. A quick way to fill the space and suppress weeds. WONDERFUL service for local gardeners. Grow right!